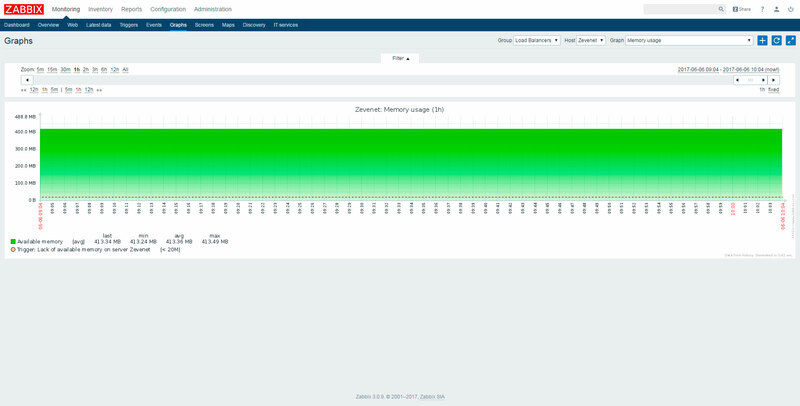 The goal of this article is explaining how to monitor Zevenet’s system health and performance with Zabbix monitoring system. Zabbix is a popular enterprise open source network and application monitoring software created by Alexei Vladishev. In this document we will use Zabbix Linux Agent to get metrics from Zevenet ADC Load Balancer appliance. We have chosen this method because is the easiest way to monitor the system health and performance of a Zevenet ADC Load Balancer appliance. 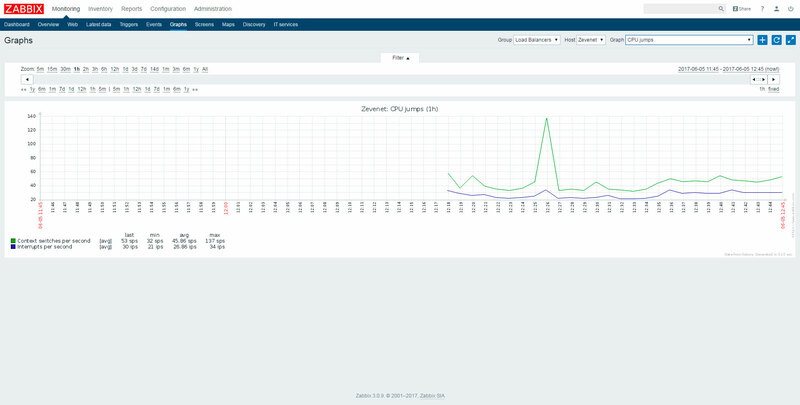 In further howto’s, we will explain how to setup SNMP daemon to implement SNMP monitoring and how to use ZAPI for getting custom metrics from your Zevenet appliance. Explaining Zabbix Server installation and setup is out of the scope of this document. You can refer to Zabbix official documentation https://www.zabbix.com/documentation/3.0/manual/installation in case you need help installing and configuring Zabbix Server. 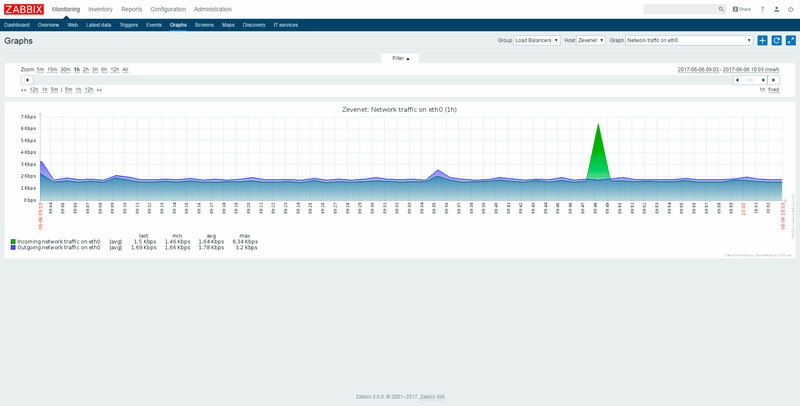 Connecting to repo.zabbix.com (repo.zabbix.com)|162.243.159.138|:80... connected. Selecting previously unselected package zabbix-agent. #       List of comma delimited IP:port (or hostname:port) pairs of Zabbix servers for active checks. #       If port is not specified, default port is used. #       IPv6 addresses must be enclosed in square brackets if port for that host is specified. #       If port is not specified, square brackets for IPv6 addresses are optional. #       If this parameter is not specified, active checks are disabled. #       Unique, case sensitive hostname. #       Required for active checks and must match hostname as configured on the server. #       Value is acquired from HostnameItem if undefined. 4. 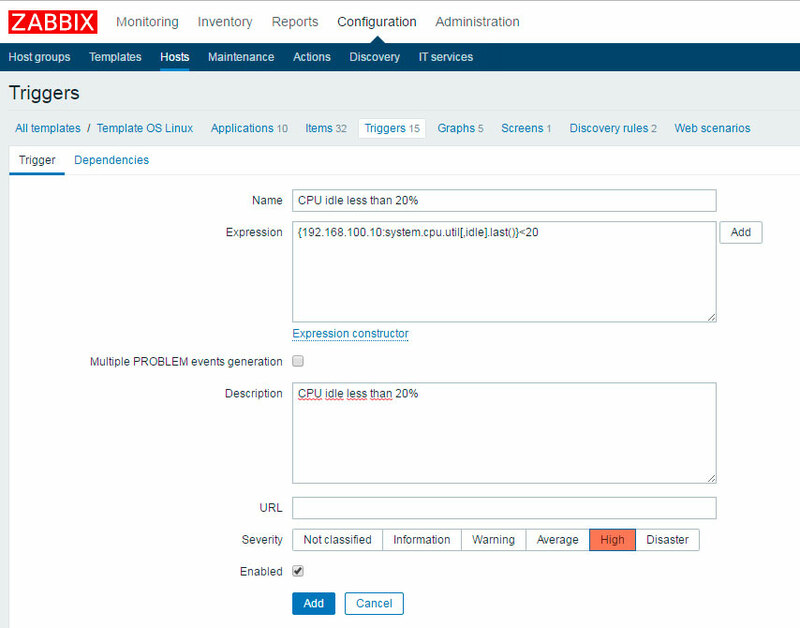 Link Zabbix agent to correct runlevels, making sure Zabbix agent will start automatically in case of a system reboot. At this point, we are ready to access Zabbix Server web administration interface, adding Zevenet ADC Load Balancer to Zabbix host database therefore Zabbix can start to monitor it. 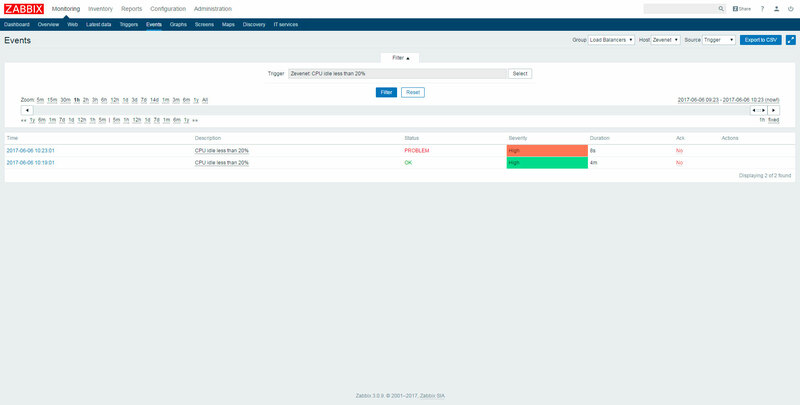 Access to Zabbix Server web administration interface. Go to Configuration > Hosts > Create Host. 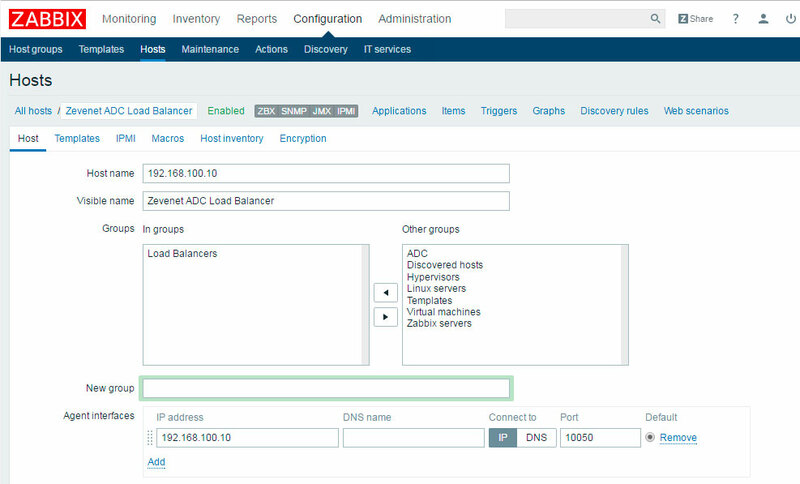 Host name (Mandatory): Type Zevenet ADC Load Balancer appliance FQDN hostname or IP address. Visible name (Mandatory): Type Zevenet ADC Load Balancer appliance visible name. Agent Interfaces: (Mandatory): Type Zevenet ADC Load Balancer appliance FQDN hostname or IP address. Remember to set to “Connect to” to IP if you enter a IP address or DNS if you fill a FQDN hostname. Click in Templates tab and add template “Template OS Linux”. That’s all! You can check all the metrics that Zabbix are able to get out of the box. Go to Monitoring > Graphs and select the graph type you want to see. Now we have our Zevenet ADC Load Balancer monitored with a minimum effort, so now what? We are going to see how to create a custom trigger in Zabbix Server to monitor a specific behavior. Let’s say that we need to monitor the CPU usage of a Zevenet appliance, and to be more specific let’s say that we want an alert in Zabbix Server if the CPU usage is higher that 20%. 1. Go to Configuration > Hosts, click on Zevenet host, click on Triggers and then click on button Create trigger. IMPORTANT: DON’T TYPE THIS COMMAND IN A PRODUCTION LOAD BALANCER, TEST IT IN A DEVELOPMENT ENVIRONMENT. IT PRODUCES A 100% CPU USAGE! Go to Monitoring > Events and wait to see a ‘CPU idle less than 20%’ event triggered.